Rome The Legacy of Rome - HISTORY'S HISTORIESYou are history. We are the future. ​Brain Box: Why does modern society still find inspiration in ancient Roman culture? Though the fall of the Roman Empire in the 5th century ushered in the European Middle Ages, the Byzantine Empire kept Roman culture alive in the East for centuries more. And even though Roman culture was in decline in the west, it never died out entirely. Even while some Roman towns disappeared and Roman buildings crumbled, people still lived in Rome. They still got up in the morning, dressed their children, said “Salve amice” (Hello friend!) to their neighbor, and tended their land. They bought and sold the same goods the Roman people had bought and sold for a thousand years. More, official government business was still transacted in Latin and would be until the 16th century. Aside from a few earlier works by Irish and Welsh monks, even poetry and literature used Latin almost exclusively until the 14th century. Today we continue to find traces of ancient Rome, not only in Europe and around the Mediterranean, but here at home in America as well. If you’ve traveled along a straight road, entered a building that used concrete as a construction material, looked at the dome of the capitol building in Washington DC, been to a stadium for a sporting event, entered into a contract, or owned property, you have been influenced by the ancient Romans. In this lesson, you will examine the long legacy of ancient Rome. How is American government similar to the government of ancient Rome? Roman laws and government continue to serve as models for modern countries. The structure of the Roman Republic influenced the writers of the U.S. Constitution who created a government based on a system of checks and balances to ensure that no single part of the government became too powerful. In the United States you can see parallels between the president and the emperor and the House of Representatives and the Roman tribunes that represented the interests of the plebeians. Roman senators made up the main political body of the republic. 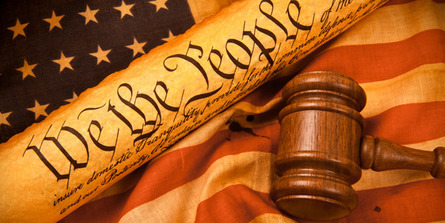 Early U.S. citizens followed that example by providing for their own Senate in Article I of the Constitution. Laws in today's democracies evolved from those of the ancient Roman and Byzantine Empires. These laws include the right to own property and to make contracts and write wills. In the Roman Republic citizens had the right to equal treatment under the law. This principle of equality inspired the creators of democracies in the United States and France. Why was civic duty important to the ancient Romans? The idea of ‘civic duty” is borrowed from the ancient Romans as well. When you vote or volunteer, serve food to the homeless or sit on a public advisory board, you are doing your civic duty. In doing those things, you are paying a debt owed to a society from which your own life is enriched. Civic duty takes on many forms. It defines an individual’s relationship to others, as well as to the state. What are three literary gifts we owe to the Romans? Roman myths have entertained through the ages. Many of the tales you enjoy go back to Roman times. Shakespeare even based many of his plays on Roman comedies. As with other things, Roman literature was also influenced by the Greeks. Roman writers adopted the form of the epic, a long poem about a hero's adventures. The Aeneid by Virgil is a well-known Roman epic. Virgil modeled his poem on two Greek epics, the Odyssey and the Iliad. The Aeneid tells the adventures of the hero Aeneas, who survived the Trojan War, sailed to Italy, and founded Rome. Romans also wrote about philosophy. For example, Emperor Marcus Aurelius wrote the Meditations, a work expressing the ideas of Stoicism. Stoicism teaches that the world was created by a divine plan. Duty and virtue help people live by that plan. What role did ancient Roman art play in the European renaissance? Roman gifts also include more tangible things such as works of art and architecture, as well as engineering marvels. Roman artists were especially skillful at creating mosaics. A mosaic is a picture made by piecing together tiny pieces of colored stone or other material. 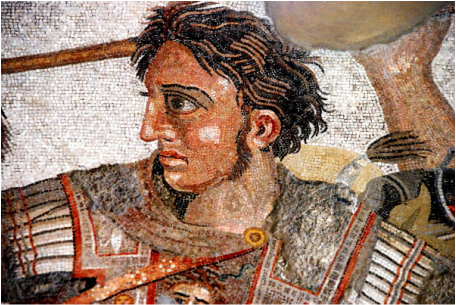 One famous example shows Alexander the Great in battle. This mosaic was found at Pompeii and measures 10 by 19 feet. Many mosaics show scenes of daily life. Mostly, mosaics were floor decorations. By Byzantine times, however, the manufacture of glass had changed. As the weight of manufactured glass became lighter, mosaics became wall decorations as well. The Hagia Sophia in Istanbul is home to numerous examples of Byzantine mosaics. Mosaics in Istanbul's Hagia Sofia date to the 6th century CE. Romans learned about sculpture from the Greeks but moved beyond the Greek tradition of showing the ideal form. Instead, the Romans created sculptures that were realistic portraits of their subjects. In the 15th century, Italian painters “rediscovered” the art of ancient Rome and Greece. In doing so, they gave birth to the European Renaissance. Early Italian artists of the Renaissance include Botticelli, Donatello, Giotto, and Brunelleschi, who designed the dome of the famous cathedral in Florence, Italy, or Il Duomo di Firenze, as it is ordinarily called. What are three architectural elements the Romans added to those they borrowed from the Greeks? 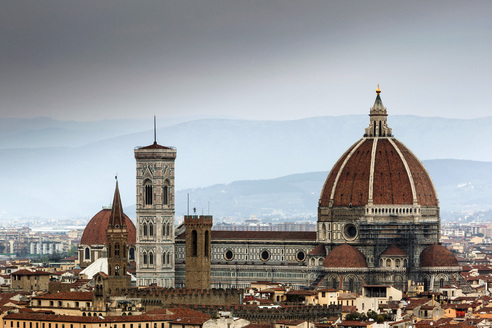 Brunelleschi's dome for the cathedral of Florence, dominates the city's skyline. Brunelleschi’s dome, shown at right, is a great example of how the ancient Romans influenced architecture and engineering. Many modern buildings borrow Roman elements of design and structure. When the US government was building our capital, they looked to ancient Rome as a model for what a capital city should look like. The capitol building that houses our government is a perfect example of Roman architectural style as is, fittingly, the Jefferson memorial. Thomas Jefferson was especially interested in the Roman “style” and used it as inspiration when building both his home, Monticello, and the University of Virginia. The Rotunda on the grounds of the University of Virginia reflects Jefferson's love of Roman architecture. Of course, Greek architecture influenced Roman builders. You've already learned about the Greek building style, with its use of columns, pediments, and graceful proportions. Roman builders, however, were also excellent engineers. The Romans used the Greek elements, added their own ideas and, in doing so, they found new ways to improve the structure of buildings. These ideas included the use of arches, vaults, and domes. A vault is an arch that forms a ceiling or a roof. While the Greeks had experimented with the corbeled arch, extending what they had learned to build the first domes - Agamemnon’s tomb is a great example - the Romans took domes to new, um, heights. When Hadrian commissioned Agrippa to build the Pantheon in Rome, new standards for domes were set. At 142 feet, the Pantheon's dome is as high as it is wide. Now, almost two thousand years after it was built, it remains the world's largest unreinforced concrete dome. Past: Roman architects experimented with using a series of arches placed in a circle to create a dome. The dome of the Pantheon at left is 142 feet high. The Pantheon was built during the reign of Augustus. A Dome: ​Domes are strong because pressure at the top is distributed evenly as it travels down the curved sides. An egg's dome shape gives eggs their strength. If you try to crush an egg by pressing on its top, it will not break. Brain Box: What is the Roman architectural style? In 1907 Frank Lloyd Wright designed a cast, concrete home. Roman developments in building construction made it possible to build larger, taller buildings. The Romans developed a form of concrete that was both light and strong. They poured the mixture into hollow walls or over curved forms to create strong vaults. 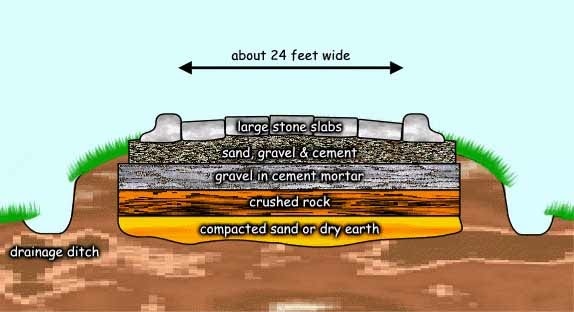 Concrete is one of the most common building material today, with builders still using the Roman method of pouring concrete into molds. In fact, the famous architect, Frank Lloyd Wright, was such a big fan of the method that he designed entire homes that used the method. Not only did he form walls using the method, he even used concrete molds to form the home’s furnishings, including dining room tables and sofas. The Romans built aqueducts throughout their Empire as a way to bring water to cities. An aqueduct is a waterway made by people. Aqueducts brought water to public fountains where people could collect water for their homes. Aqueducts also supplied water to public toilets and bathhouses. Eleven major aqueducts brought water to the city of Rome. The longest stretched for 57 miles. Aqueducts can still be found in lands that were once part of the Roman Empire. The aqueduct pictured at right is in France. How did Roman roads help to hold the Empire together? The Romans are especially famous for the quality of their roads. In 312 BCE, Romans built the first of many roads. It was called the Appian Way, and it ran southeast from Rome. While other ancient civilizations paved streets much earlier than the Romans, the Romans were the first to connect cities with a vast network of roads. Indeed, the Romans built a system of roads that extended across much of their empire. Rome was the at the center of that system. Under the emperor Diocletian, the Roman Empire had 372 interconnected “main roads” that extended 53,000 miles. By comparison, today’s US interstate highway system covers just a little over 46,000 miles. Past civilizations leave their mark through ideas as well as through objects. The western and eastern parts of the Roman Empire had great influence in the areas of religion. The Roman Empire played a major role in the spread of Christianity. Christian missionaries converted many within the Empire. During the Middle Ages, the Roman Catholic Church became the most powerful organization in Western Europe. With both the Roman Catholic and Eastern Orthodox churches spreading Christianity, most of Europe and some parts of western Asia became Christian. From the Middle Ages until the 16th century, the Roman Catholic church was the most powerful political organization and the Bishop of Rome, or Pope, was the most powerful political figure on the European continent. More, through those Dark Ages, a time before the printing press, when all texts were written by hand, it would have been easy to lose the lessons the ancients taught. Indeed, much was lost during that period. However, in addition to scholars living in the great learning centers in Islamic capitals of the Middle East, it was monks working in monasteries of the Roman Catholic church who pursued, preserved and kept alive the legacy of the ancients. Brain Box: Does the word "invention" or "innovation" best describe Roman contributions to history?